Singhbhum District recruitment 2018. These vacancies are for the DMFT and SCA for mining affected area and LWE affected area of Chaibasa under West Singhbhum District. 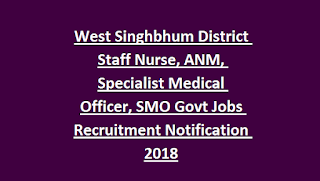 Candidates who are looking for this West Singhbhum District MO, SMO and Nursing Staff they can send their application form through email to awc10.monitoring@gmail.com or through speed posts to Department of Social Welfare, West Singhbhum, Chaibasa. Last date for submission of application form is 07-12-2018. 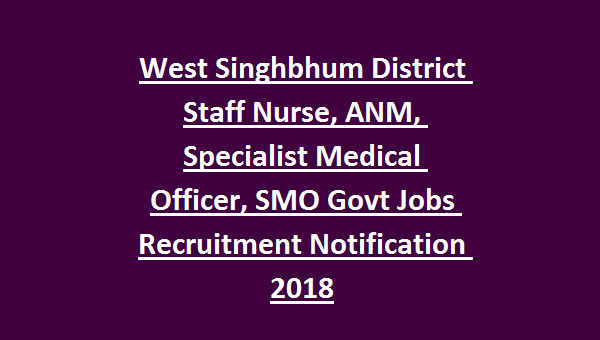 Detailed information about this Office of the District Commissioner West Singhbhum Staff Nurse, ANM, Medical Officer Jobs is given below. Last date of application form submission is 07-12-2018. There are total 92 posts in this West Singhbhum Office of the District Commissioner recruitment 2018. There is no specific age limit is given for this recruitment. Candidates selection will be based on interview & merit in qualifications and Experience. Candidates have to send their application for through Email or through speed post. For Speed post/registered post is Department of Social Welfare, West Singhbhum, Chaibasa.